A MAN from Bataan who has been paralyzed for more than 15 years received a wheelchair from the personnel of the Regional Community Affairs and Development Division (PRCADD) over the weekend. Senior Superintendent Oscar Jacildo, chief of PRCADD, said that the man, whom he did not identify, is from Barangay Capunitan, Orion town. Jacildo said that local residents there who were fire victims previously received food parcels and clothes. He said that the beneficiary of the wheelchair was also a fire victim. 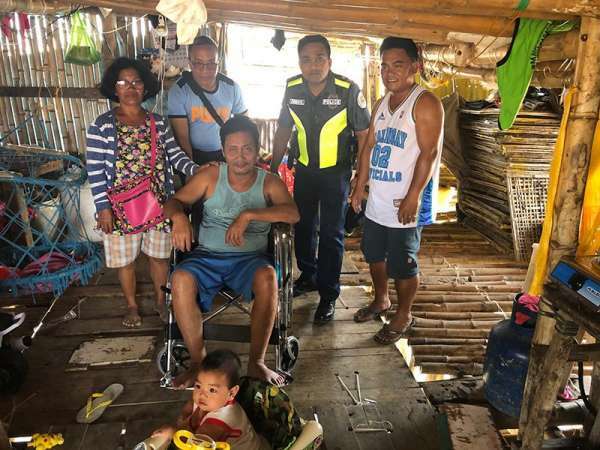 The old man and his wife were surprised when the policemen who braved the arduous trek in reaching their place knocked at their door with the brand new wheelchair. “We are determined to find a wheelchair for him because of his wife’s request during our relief operations here. We also want him to be comfortable that is why we pitched in to buy him one,” Jacildo said.